You're not dreaming. It's FurReal! This playful little guy is just learning the tricks of the dragon trade, so he doesn't really breathe flame, but he does breathe flame-colored mist. Really! Hold the color-change treat to his mouth and watch how it changes when FurReal Friends Torch, My Blazin' Dragon breathes mist onto it! When does he breathe such colorful mist? Whenever someone touches his charm, pets his nose, or... sometimes whenever he feels like it! 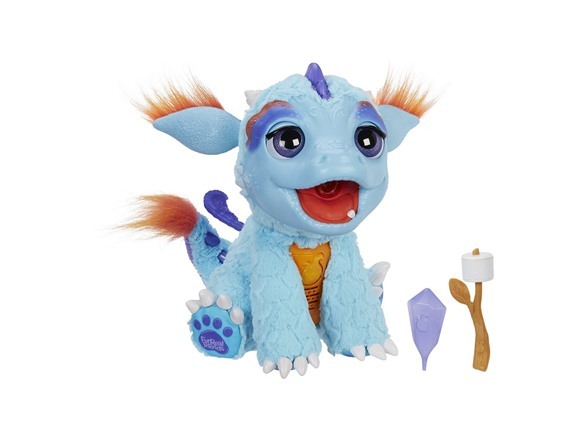 There's never a dull moment with this adorable baby dragon! Includes pet, color-change treat, water vial, 2 extra filters, and instructions. Requires 4 C batteries (Not included). Ages 4 and up. In the Box: Torch My Blazing Dragon, a Furreal Friends from Hasbro.